Today was the first day that Reeva’s mother, June Steenkamp, came face to face with Oscar Pistorius. She has never met him before and sadly her first time is at the murder trial of her daughter. June has made it publically known that she wants this opportunity to really look him in the eyes and understand what happened that night. 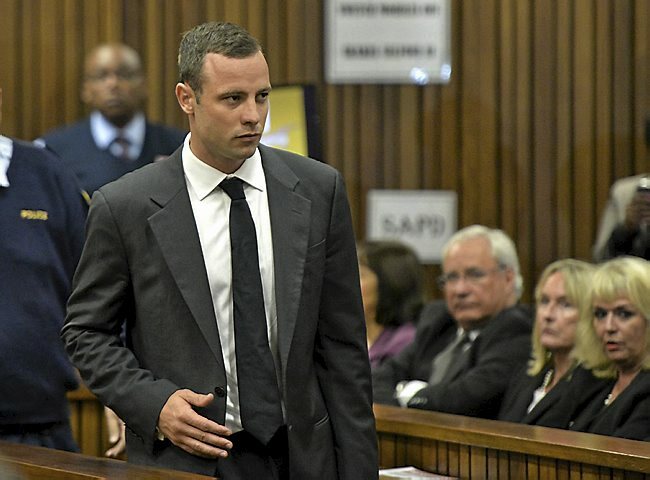 Oscar arrived at 9:52am and enters the court having to walk past the family members. June is the blonde woman, second from the right. He does not return her glances. 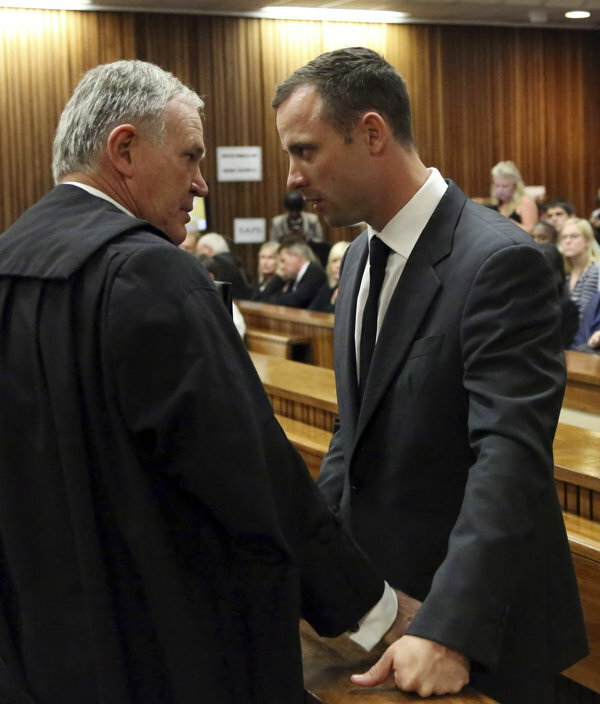 Oscar takes some time to speak with his lawyer, Barry Roux, before the proceedings. The trial proceedings will be in English, but some of the witnesses would like to speak in their native Afrikaans, therefore they have appointed an interpreter to assist during the proceedings. At the start of the day, the appointed interpreter arrives and sees the frenzy of media that is covering the case and basically freaks out. So they need to get that situation under control first. In the meantime, a woman by the name of Annemarie, who is the ex-wife of the surgeon who amputated Oscar’s legs as a child, interrupts the court with her insistence that Oscar be checked out mentally as he may have acted out due to problems from a head injury. This is not the first time that Annemarie has interrupted their court hearings insisting that he be examined. She is promptly escorted out. The charges against Oscar are read and he enters his pleas. He pleads not guilty to murder. He also pleads not guilty to other gun related charges that have been added on to this trial. The gun charges are unrelated to the death of Reeva, but they help the prosecution paint a picture of Oscar being a gun-crazed man. In one incident, he allegedly fired a gun in to a restaurant. In another incident he allegedly shot a gun out of the sunroof of a car. From what I have come to understand, this is standard practice in South Africa to pile on multiple charges for multiple incidents. This would not happen in American courts where each offense would need to be tried separately. Now typically in American courts the trial would start with formal opening statements from each side, the Prosecution going first. That does not happen here. Kenny Oldwage for the Defense entered their explanation first. Then Gerrie Nel outlines briefly some of the details of the Prosecution’s case second and presents some evidence to be catalogued. It was all somewhat brief and informal. The first witness up is Michelle Burger. She is a lecturer at the University of Pretoria. Her house borders the Silverwood Estates where Oscar lived. She is about 170 meters away in a community called the Silver Stream Estates. The Burger’s bedroom window faces the back side of Oscar’s home (where the bathroom windows are located) and their window was open that night due to it being very hot and not having air conditioning. 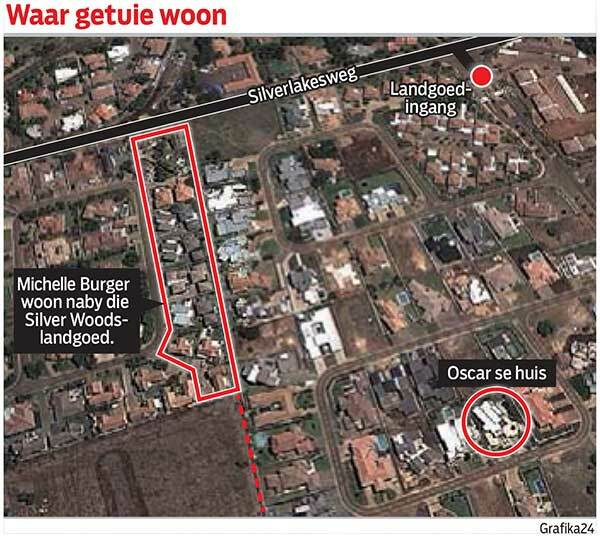 This picture shows Oscar’s house on the right and the Silver Stream Estates on the left. The red box depicts the section that Mrs. Burger and her husband live in. She described their home as being in the front row, closest to the border of Silverwood Estates. Their bedroom is located up on the 2nd floor. In the middle of the night, with windows open and no fans, it does seem likely to me that they would be able to hear loud noises coming from that direction. On the night of February 13, 2013, she and her husband were home and went to bed between 9pm and 10pm. Both she and her husband were awakened at 3am by the sound of a woman screaming very loudly. Her husband went to the balcony while she stayed sitting up in bed. The woman was screaming for help. And then they heard a man’s voice also scream for help 3 times. Mrs. Burger called her husband back inside and had him call security from her cell phone which was next to their bed. He spoke with two different guards who informed him that they did not cover security in the neighboring community so they hung up. Her husband then went back to the balcony while she still remained in bed and the woman’s screaming was now getting progressively worse. She described it as blood-curdling, like somebody who was in fear for her life. After hearing the woman’s escalated screams they then heard 4 shots. There was a noticeable pause after the first shot and then 3 additional shots rang out. There was some screaming throughout the duration of the shots, but it became quiet after that. They did not hear anything else. The husband came back in from the balcony. Their assumption was that a woman and a man were being attacked by someone who broke in to their home. Mrs. Burger even made the statement to her husband that she hoped the woman wasn’t witnessing her husband being shot in front of her. She and her husband eventually went back to bed and then got up and went to work the next day. She called a friend to tell them about the events from the previous night. She also talked to a few co-workers about what they witnessed. Her husband called her in the afternoon to ask her if she remembered what happened. She replied yes, she did remember. He then told her that Oscar Pistorius was on the news and was saying that he mistakenly shot somebody he thought was an intruder. The husband immediately thought that wasn’t right because it didn’t match what they had heard. They eventually hired an attorney because they wanted to handle the matter privately and go to the police privately considering the intense media coverage. Apparently it was a few weeks after the event when they gave their statement and some have viewed that as suspicious. Barry Roux then cross-examines Mrs. Burger and tries to paint the picture that from the very start of this event, the Burgers considered Oscar to be a liar. And also accuses her of comparing stories with her husband to get their testimony straight before going to the police. Michelle was pretty solid on the stand after several hours and stuck to her testimony. Stated that she is only testifying to what she heard, she had no pre-conceived notions about Oscar, they did not know Oscar, and she is only stating what she heard and what she heard does not match Oscar’s story. She also reiterates that she and her husband are each individually giving their own statements. He will have his opportunity to testify in court just as she is. Their stories do not match word for word. They are each giving their own accounts of what they heard/witnessed that night. Roux suggests to Mrs. Burger that the screaming she heard could have been Oscar’s high-pitched screaming that made him sound like a woman, and that in fact it was not a woman at all. She was very adamant back to him that she clearly heard two different voices initially screaming. One was a man and one was a woman. She did not waiver on that at all. She said the sound of the woman’s screams was extremely traumatic and was different than the man’s utterances of help three times. She has no doubt in her mind that it was a woman. Barry Roux also suggested that the 4 gunshots that she heard could have actually been the cricket bat hitting the door. He needs to find a way to explain why the Burgers heard a woman screaming prior to the gunshot sounds. According to Oscar, Reeva never responded to him that night. There was no fight between them that night and he blindly shot at what he thought was an intruder. So a woman screaming is a big problem for his defense. Roux is trying to convince this witness that she and her husband slept through the initial gunshots, and that the screams that woke them were those of Oscar’s and the other loud sounds were the cricket bat. But the witness stuck to her story all day regardless of the relentless questioning and never waivered to what Barry Roux was suggesting. 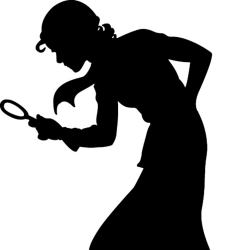 Roux pushes on… If Mrs. Burger is so sure that she clearly heard gunshots and screams, why did she not also hear the cricket bat banging on the door afterwards? Her explanation is that she is too far away to hear that. She is also too far away to hear regular talking. Now this will come down to some scientific testing, I would think. It seems that high pitched screaming and gun shots would have a different sound wave capability than wood hitting on wood. But that’s just my own speculation. I’m sure the Prosecution will address this. Mrs. Burger again was clear that she did not hear a cricket bat banging on wood after the gunshots. She only heard screams and then 4 gunshots and that’s all. Roux next criticizes her for going back to bed after such a traumatic event. She states that she was indeed very upset that night by what she had heard. She didn’t immediately go to sleep, but at some point she did fall asleep again. She states that she can sleep during difficult times. She recalls how her sister just recently lost her baby and she was able to sleep that night. It’s not impossible for her to sleep when upset. Next, Roux suggested that she was being more dramatic about the event in court than she was in her original statement to Van Aardt (the detective who took her statement). She stated that she very clearly expressed her emotions of that night to Van Aardt and he wrote what he wrote. Apparently he did not include “blood-curdling” in his description so Roux wants to make it sound like she is overly stating the sounds of the screams that were heard that night now that she is on the stand. They adjourn for the day and she will be back on the stand tomorrow. I think it was Day 1 but the intiial exchange between Roux and Burger was PRICELESS. I couldn’t stop laughing. It seemed like two crazy people. He tried to ask her the same question for about 20 minutes and she just kept talking about all sorts of other things like she was clueless and talking to herself in a parallel universe. He was SO frustrated. I wouldn’t have lasted 1/4 of the time he did before I would have been shouting at her and/or requesting that she take a mini-mental status exam. It was SO bizarre. THEN, because we couldn’t see who was who, it was so odd that she would talk in Afrikaans, the translator would speak in English and the witness kept correcting. I wasn’t sure whether there were two people talking or three – and had no idea, for quite awhile, which voice belonged to the witness. Several people who wanted to testify in Africaans seemed like they spoke PERFECT English. I just couldn’t figure it out.